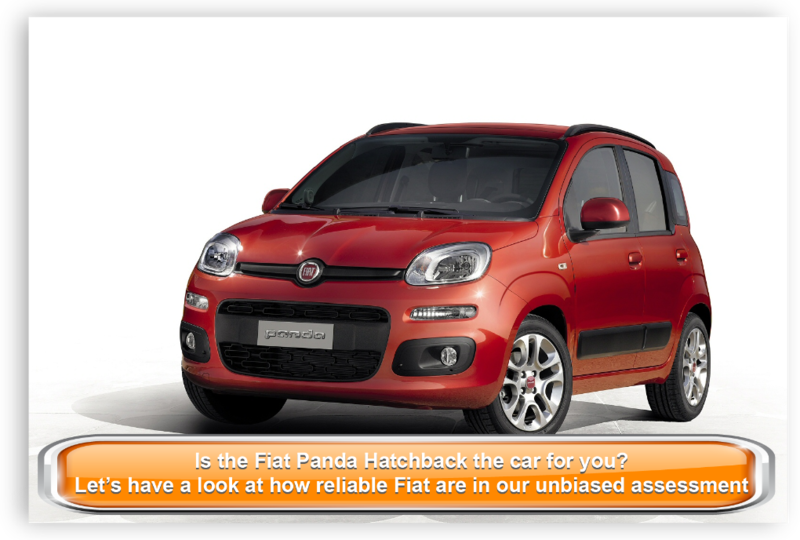 Looking for an objective review of the new Fiat Panda Hatchback? OSV has got you covered, from engines to lease deals. As ever, the new Fiat Panda Hatchback is affordable. But it’s lost none of the qualities that have made it so endearing down the years: It continues to be cheerful, spacious, usable and good fun to drive. It’s also cheap to run. The Panda is a more practical alternative to the Fiat 500. It hasn’t got the city car’s unique charm, but its upright shape give it a certain sense of style while freeing up more space indoors. 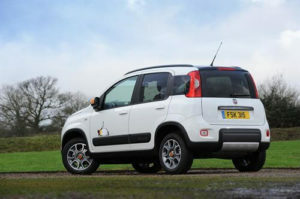 OSV takes a look at what it’s all about with our Fiat Panda Hatchback review. The Panda’s natural habitat is the town and city, where its light, easygoing nature makes it easy and even fun to drive. There is a City button located on the dash which enhances the light steering, making it easier for you to navigate what would otherwise be tricky twists and turns. The soft suspension setup, meanwhile, does a good job of absorbing lumps and bumps, thereby reducing unpleasant bounciness. However, its small engines come unstuck on the motorway, where their deficiencies are exposed. The car’s high sides also mean that there is quite a lot of buffering on long stretches of expansive roads. The engine range opens up with a basic 1.2-litre petrol engine that delivers up to 68bhp. It can get you from a standstill to 62mph in 14.2 seconds before maxing out at 102mph. It’s a bit of a noisy engine, and you will have to do a bit of planning before rushing into any overtaking. Otherwise, it’s a good choice. If you want a bit more power, there is a more expensive 0.9-litre TwinAir petrol engine on offer. It’s turbocharged, responsive, economical, and can do the 0-62mph dash in just 11.2 seconds. Its two cylinders rattle a fair bit, which might be off-putting to some buyers. It’s just a case of try before you buy. Like last time around, there is only one diesel engine to choose from. The difference this time is that you can’t get it with the entry-level Panda. It’s a 1.3-litre engine that is faster than the 1.2-litre petrol but slower than the turbocharged 0.9-litre unit, and it’s the best engine in the range for motorway cruising. All engines are paired up with a 5-speed manual transmission as standard, but you can add the Dualogic automatic ‘box to the TwinAir model if you wish. However, it’s a bit jerky. Thanks to its unusually tall shape, the new Fiat Panda Hatchback feels airy and light inside. Large windows also help in this regard, brightening up the cabin and creating the illusion of more space than there is (though there is already a good amount of room available). The “squircle”, as Fiat have termed it, is back. A regular fixture in the Panda, this round circle is located on the dials, the buttons and the dashboard. It’s a nice touch that heightens a sense of familiarity. If you’ve owned a Panda before, you feel as though you’re welcoming back an old friend. Apart from that, the interior on the whole looks good but is not as high quality as some of its rivals. There are parts that are a bit cheap, and build quality is questionable. We’re not sure how long this car will be able to cope with everyday family life on the road. The entry level Pop model is pretty basic. It’s powered by the small 1.2-litre petrol engine and gets four airbags, powering steering and an MP3/CD stereo as part of its standard kit – and that’s it. It’ll do for those on a budget, however. The mid-range Easy model is more attractive and gets roof-rails, central locking, and air conditioning, while also giving you a choice of engines. The range-topping Lounge model adds 15” alloys, heated door mirrors, body-coloured door handles and fog lights but is considerably more expensive. Air conditioning and roof rails can be added to the Pop model for extra cash, but it probably makes more sense to just upgrade to the Easy model. Optional extras for the Easy model include a panoramic sunroof, alloys and a leather steering wheel. Prices for the new car start out from £9,500 and rise to £15,100, making it one of the most affordable cars in this sector. The Panda is cheap to keep on the road. The cheapest of the engines to buy is the 1.2-litre petrol model, but despite averaging impressive fuel economy returns of 55.4mpg it’s a bit underwhelming in terms of performance. However, the fact that you’ll only have to pay £30 a year in road tax if you get it registered before April 2017 might help to sweeten the deal for you. The 0.9-litre petrol engine averages fuel economy returns of 67.3mpg and doesn’t cost anything to tax right now. Pair it up with the automatic gearbox, and it’s even cheaper to run – returns of 68.9mpg are certainly not to be ignored. However, this transmission is not fantastic. When it comes to insurance, the Panda sits between groups 3 and 7. The new Panda is both cheap to buy and run, making it a wise investment for anyone operating on a strict budget. There might not be many engines to choose from, but the 0.9-litre TwinAir petrol unit is a standout choice in the whole class. It’s responsive and emits an entertaining noise. The City button is a good addition, as it lightens the steering, thereby improving drivability. The car is tall, which is great for headroom. But not only is the rear bench a bit cheap, it’s also cramped. Low-rent materials means the Panda ultimately falls short of the standards set by the likes of the Volkswagen Up! 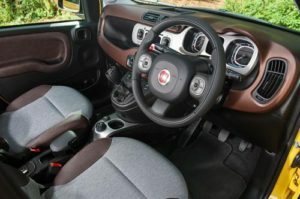 Let’s see how the car compares against its two closest rivals in the comparison section of our Fiat Panda Hatchback review. The Ford Fiesta Hatchback has been around for over two decades now, and it’s finally scaled to the heights of being the UK’s best selling car – and for some very good reasons. Easily the most entertaining car to drive in this market, the Fiesta can be enjoyed by anyone, from enthusiastic boy racer-types to city commuters to young families. It’s nimble, agile and a whole lot of fun. The controls are easy to use, visibility is good, and the ride is smooth. The smallest engines are the 1.25 and 1.6-litre petrol units that are now looking and sounding a bit dated. They’re both worth overlooking. The 1.0-litre EcoBoost petrol engines are when things start to get interesting. Available in either 98 or 123bhp guise, they are eager, quiet and lively. The less powerful of the two can do the 0-62 dash in 11.2 seconds, while the more powerful of the pair does it in just 9.4 seconds. There is also a 138bhp EcoBoost engine available which is even quicker, though the fastest of all Fiesta’s is the ST model. A solitary 1.5-litre TDCi diesel engine completes the range. In its most powerful form it’s quick enough, but it’s the money it will save you at the pumps that makes it so appealing. Whichever power output you go for, you can achiever fuel economy returns of 88mpg. The EcoBoost models also make financial sense, and are from road tax. 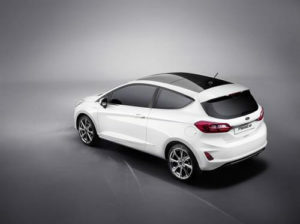 Both inside and out, the new Ford Fiesta Hatchback looks the part. It’s edgy and dynamic on the outside, and comfortable on the inside. The materials used are of a high quality, there is plenty of advanced technology on offer, and the sweeping design of the dash is attractive. Fit and finish is the only thing that lets it down somewhat, as it’s a bit flimsy. The Fiesta is a moderately practical car, but far from class-leading in this department. The 290-litre boot falls short of class standards, and a large boot lid doesn’t help matters. However, the low loading lip and wide opening make it usable enough. A car like this is dealt a bad hand from the start, as the dimensions are the same for all across this class. You can’t expect there to be a heap of interior space, but it is at least was enough to park. Head and legroom is not fantastic in the back, but you can get the Fiesta as a five-door instead of three for a bit more usability. There are plenty of storage spaces in both versions. 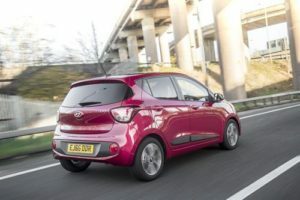 The new Hyundai i10 Hatchback is one of the best city car’s of its type on the market right now. It looks great, houses plenty of space inside, and doesn’t cost all that much to run. If you want to be able to get from A to B without any hassle, the i10 is tailor made. It isn’t much fun, but it’s stress-free and a competent enough performer. Improvements include a new suspension setup that offers more comfort, as well as a few modifications to the running gear. The steering has also been tweaked so that it’s now more precise. On paper, the i10 Hatchback doesn’t seem so fast, but thanks to how light and compact it is, it feels sprightly enough once you get going. The smallest engine is a bit underwhelming, and can only deliver up to 655bhp at best, but the 1.2-litre 86bhp engine is a good choice. It can get you from a standstill to 62mph in 12.3 seconds and doesn’t shirk at higher speeds. Unlike its rivals, there are no turbocharged engines in the range. There are also no diesel units. There is an automatic ‘box available if you want it, but with just four gears and worse economy, it doesn’t come recommended. One of the i10’s biggest strengths is its running costs. Thanks to how small the petrol engines are, none of them will cost you more over £130 to tax each year. The 1.0-litre 65bhp model can achieve fuel economy returns of 60.1mpg while costing £20 a year to tax, when paired up with the base-level model, but if you go for the SE Blue trim, stop-start technology improves the economy to 65.7mpg. The interior is a pleasant place to be. It’s quiet, comfortable and relaxing, which all contributes to a hassle-free driving experience. The dash looks smarter than ever, while build quality has also been improved. You can personalise your i10, too, with a few different colours available for the dash. Practicality is good. The i10 Hatchback has five doors, a roomy interior, and its 252-litre boot is the biggest in its class. You can fold the rear seats to boost space to 1,046-litres. The new car has plenty of personality and a great sense of fun, which is not something you can say of some of its rivals. It’s bigger than last time around, taller, and comes with lots of storage spaces so that it’s easy to keep it clean and tidy. The car can also boast lively handling, comfort, and good visibility. 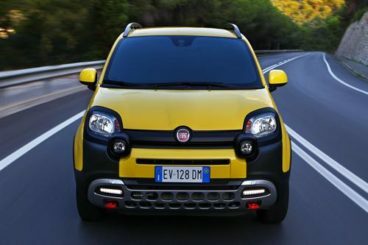 Altogether, the new Fiat Panda Hatchback represents a great choice.